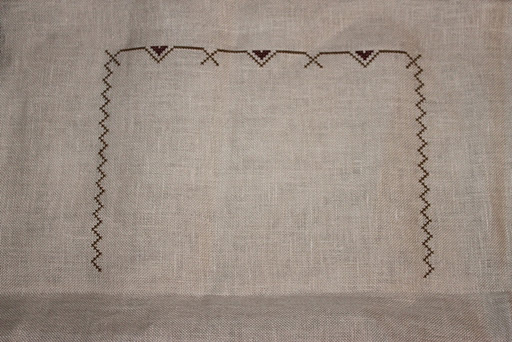 Today for Crazy day 5 I started LHN’s “Robin Hood”, this is a Thursday SAL with Linda over at Stitchin with my Furbabies this is the progress I made on it in the last 3 hours, well in between catching up on Greys Anatomy and NCIS LA lol…. really looking forward to doing more on this and as this is a birthday present that needs to be ready for March watch this space ! While going round on my usual blogs Dani at Dani:Black Belt Stitching Wizard was blogging about how she sets out her monthly goals for her stitching and just for herself really, no pressure no hassle if they are not met, just goals to aim towards in the month and I thought what a good idea this was, as I have so much on this year, or at least planned I thought this might help break it down into more sizeable goals so here goes…. Start 15 crazy challenge pieces. Finish my One Row Lace scarf and start another scarf for an Xmas present. This is the bulk of what I want to aim for. I’ll be back at the start of February with a review of what I accomplished and goals for February..
Time for bed now I think…morning is calling.. This entry was posted in Uncategorized and tagged LHN, Robin Hood, SAL. Bookmark the permalink. I think your thoughts on personal goals is a good idea. When I settle down to stitch each day I usual set a goal of how much of the chart I want to sew. Sometimes I do more, maybe less, I may stitch longer than I intended to reach that day's goal but no pressure.You are wonderfully organised. How nice it must be to have the children around you, they grow up so quickly. Great progress on Robin Hood Ruth. I decided to give blogs a look tonight and imagine my surprise at finding you still awake! And working away at your blog! You silly, crazy goose!